“Simple” can be better. Here’s how to create a straightforward portfolio that can beat most investors’ returns. One of my favorite pastimes used to be just tracking my fledgling stock portfolio as it bounced around in value. That was when I had all the time in the world to check my accounts at various discount brokers, to compulsively watch stock ticker symbols while catching the next market-shifting news on CNN Money. These days, I have no time nor energy to keep up with the daily blips in the stock market and not so coincidentally, I’ve adapted strategies to try to simplify our finances as much as possible. and a combination thereof. As time has passed, our investments have turned into a cornucopia of investments representing these various financial categories located in various financial institutions (mostly at online brokers), and it has become one hairy matter to get a handle on everything. In reality, you don’t need things to be so complicated. If you’re interested in participating in the stock market with a good chance of beating most investor’s returns while making it super easy on yourself, you don’t even need to hire a stock or financial pro to do it. It’s true: beating the average investor’s record is easier than you think. Note that this is not the same as beating the market, the difference being explained in this post. So one thing we’ve striven to do is to prune what we have with the goal of ending up with something simpler, more basic, more manageable, and which still does the trick. If you want to participate in the stock market and don’t know how to begin, then what I’m mentioning here could be enough to get you going. I also believe you won’t go wrong by adapting any of these approaches as your main investment strategy. I’m actually surprised that people have preferred to shun such straightforward portfolio set ups for something more exotic (and maybe more exciting), but if I were to do my portfolio all over again, I’d do it the simplest way. I still consider our portfolio to be moderately complex and the one big reason we have for not consolidating so comprehensively is because of tax ramifications that we could trigger by heavily modifying our portfolio set up. But whenever we get a tax-free opportunity, we do cut down on existing funds we already have. The most straightforward way to go about investing with your eyes closed (well, almost) is with an automatically arranged portfolio suited for your risk profile or age or length of investment period. You’ll find such portfolios professionally managed, well-diversified and very convenient to buy into and own since the asset allocation is built into these investments. The terms “lifecycle” and “target date” funds have been used interchangeably in the industry but are sometimes differentiated as follows: a lifecycle fund is one that has a preset asset allocation based on a given risk level (aggressive, moderately aggressive, conservative) and this allocation stays constant regardless of how long you hold it; whereas the target date fund is one that shifts in allocation based on a target retirement date that the fund itself has specified. All you have to do is decide what your risk level is or select your target retirement date in order to zero in on the appropriate fund for you. Seems to me that you can just place all your money into such a fund and you’d be set since a professional will be worrying about your asset allocation and diversification requirements for you. Still, the financial world is not without its critics of such “convenience” funds. Here’s a handy look at lifecycle and target date funds, where we cover its pros and cons. Now what if you desired to control your own asset allocation yourself? This may be your preferred approach if you’re looking for flexibility with your allocation and with what you decide to actually own, or if you just don’t trust anyone else running your portfolio in your behalf. The simplest portfolio should be comprised of the smallest number of investments you can put together that is still well-diversified and properly hedged. #1 Strongly consider “passive” investments. This just means that fund managers or brokers aren’t behind the scenes running your investments. I prefer indexed investments because there are no surprises here — they simply track benchmark index returns. As I’ve mentioned many times in previous posts, trying to consistently beat the market for the long term is an elusive quest. Plus, indexed investments are not actively traded and therefore will have lower taxable capital gains (they’re not traded actively) as well as much lower annual management fees — 0.5% and under, as opposed to actively managed equity funds with yearly fees of at least 1% of account values. #2 Start out with ETFs if you have a small amount to invest. My investment of choice is an index fund or an index ETF to keep with a simple and passive approach to investing. But because most mutual fund companies that offer index funds require you to invest with several thousand dollars (e.g. $2,500 and higher) to open a new non-retirement account, it is more feasible to invest in ETFs when you have small amounts to work with or are just starting out. ETFs allow you to participate in the stock market though it costs more than mutual funds, with transaction fees taken out when you buy and sell. Once you’ve got more to invest — say $10,000 — then look into diversifying with index funds instead. Here’s more on ETF investing. You can also check out these popular ETF brokers for how they handle ETF trading and investing. #3 Find representation in basic asset classes using the fewest funds possible. One can argue inclusion of other asset classes such as currencies or perhaps sector funds for more specialized representation, but in my mind, the above five asset classes are sufficient to keep you reasonably diversified. I would have no qualms putting my money to work using the following ETFs or corresponding index funds according to this allocation I’m personally comfortable with. Note that your allocation may be different since it’s based on your own comfort level. ETF: Vanguard Total Stock Market VIPER (VTI), which tracks the Wilshire 5000, an index of approximately 6,500 U.S-based stocks. It’s like virtually buying the entire stock market. ETF: iShares MSCI-EAFE (EFA), which corresponds to the Morgan Stanley index of stocks trading in Europe, Australia and the Far East. ETF: iShares Lehman Aggregate Bond (AGG), which attempts to track the price and yield performance of the total U.S. investment grade bond market. ETF: iShares Dow Jones US Real Estate (IYR), which holds a basket of 75 real estate investment trusts (REITs) that represent that sector of the U.S. economy. ETF: iShares Dow Jones US Basic Materials (IYM), which includes stocks in the energy, basic materials and precious metals sectors. If you notice, I snuck in a cash allocation in this portfolio, but this is according to my own preference and because I incorporate my emergency fund savings into the whole picture. You have the option of doing away with a cash allocation altogether if you feel fine about a fully invested position or if you manage your cash savings separately. 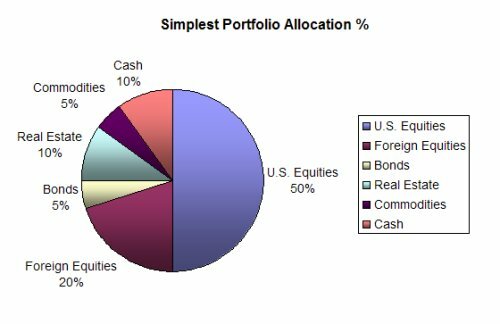 Other straightforward allocations I’ve seen involves just dividing one’s funds equally among all the asset classes, such that 20% is placed in each of the 5 asset classes minus the cash segment. One of my favorite mottos is: less is more. That goes for my idea of how much make up I should be wearing and how much clutter I should have lying around my home. Same thing goes for funds and accounts. I like the flexibility of handling my own portfolio and I also like it to be easy, simple and as passive as possible. I believe you can beat most other investors in your sleep, literally, just by adapting the simplest investment portfolio ever. Now you’ll just have to learn to ignore the volatility and pay attention to your funds when it’s time to evaluate and rebalance. Your Mutual Fund Investment Portfolio: How Many Funds Should You Own? Nice allocation strategy. Once my Vanguard account is large enough I’ll be looking into funds like these. Thanks for putting this together! yeah I agree it is very simple to beat the average investor. typically because you don’t have to manage the same amount as they do. There is an even easier one that actually has a stronger track record. I like that take on basic portfolios. I agree that even 2nd graders can come up with portfolios that can beat most our returns. Again, the “simple” approach to things can really work wonders. So why would so many prefer to overthink things? Did you see the 60 minutes piece about the World Bank? A lot of foreign buyers bought hedge funds that included sub prime mortgages. Some of them are now worth nothing on the dollar. The most important thing is to not let the emotion of the day get in your way. The reason you diversify is that some piece will be up while others are down, or at least not growing as fast. Not so you can invest in 5 high risk areas as opposed to one! With just 3 holdings, you would own the entire world’s stock market, real estate market and inflation-indexed bond market. An absolutely beautiful portfolio if you can put it together. Unfortunately, most of us are forced to face complexity because we have to work around our limited 401K choices. That’s excellent! I’m always on the lookout for suggestions like you’ve offered. I aim to own a portfolio like that — if only I can consolidate without having to trigger tax consequences! I agree that it looks downright beautiful! I like to keep my investment portfolio simple as well. I have 80% invested in a long-term portfolio of shares whose only criteria is that based on earnings forecasts they could potentially double their earnings in 5+ years time. The other 20% is used to take advantage of short-term opportunities to buy quality companies at bargain prices, and hold for just a few weeks or a few months at most. The listed Vangard fund for US stock allocation (VGTSX) is actually a foreign sector fund. It holds no US equities at all. It tracks European, Pacific, and emerging market stocks. I think the ticker symbol you are looking for is VTSMX. Excellent read. I have been using the MSN portfolio for about 7 months now and have about 16% of my portfolio allocated to it. It has certainly held its own compared to my other investments. I plan to include your article in my weekly carnival review Friday. If you are going to give out financial advise, you might want to make a disclaimer that states you are not a Certified Financial Planner and that all of this advise is simply opinion. The customary disclaimer: I would like to remind everyone that I am not a professional financial adviser and what I share here with you is based on my own personal experiences and research, and is heavily riddled with a lot of subjective opinion. Read, learn, surf, lurk and form your own conclusions. If you find anything here that is yours which you’d rather I not borrow, that’s cool — just let me know and I will take it down. And my employer has absolutely nothing to do with this blog. Right now the place to look is the Japanese market. Do you need to get some training on how to invest and how aggressive to trade? come and see me and we will help you 24/7. 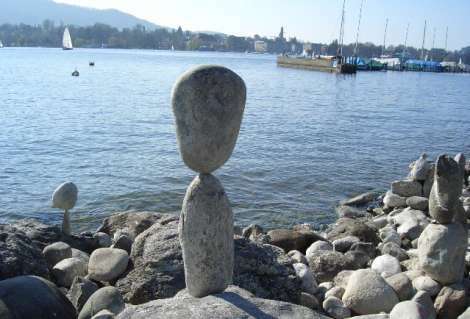 Since the market is so volatile then the way for most is the conservative way until the market begins to stabilize. Are you most? Good luck to all you trader junkies. I know that I’m a little late to this party [as the post was written in 08] but I just wanted to stop by and mention that things still haven’t changed. I think that true index investing can be a little complicated for the average investor as a good understanding of the fundamentals is required [ie look at looking at construction stocks in 2007 or tech in 99] but with a strong foundation it really isn’t that hard.